Of all the components in your car, the steering and suspension take some of the heaviest wear. Being alert to the symptoms of steering and suspension problems and practicing proper maintenance are, as always, the way to catch small problems before they turn into catastrophic and costly ones. Before reading this entry, you may want to take a quick look at my discussions of how steering works and how a suspension system works, since these provide background that will make it much easier to understand the discussion below. If you don’t already, you should know what kind of steering and suspension your car has. Does your car use rack and pinion steering or another system? Do you have power steering? Is your car front wheel drive or rear wheel drive? The answers to these questions can be found in your owner’s manual. In addition to helping you to diagnose steering problems, this knowledge will alter the way you respond to certain driving emergencies, such as entering a skid. Now let’s take a look at some of the most common symptoms of steering and suspension problems. In a few cases, these problems can be easily corrected. Most problems, however, will require the assistance of a skilled mechanic, so make sure that you’ve found a mechanic you can trust before any serious problems occur. It will feel like someone has pulled the steering wheel in your hands. You may also notice clunks or bumping noises. This most likely means that the ball joints connecting the suspension to the tires are starting to wear out. Continuing to drive with worn ball joins can result in serious damage so don’t wait to have your suspension checked! If your car has power steering, a stiff steering wheel is likely the result of a problem with the power steering system. First, there may not be enough fluid. Check the fluid reservoir. This is located under the hood and is normally labeled (See figure 1). If you have trouble locating it, consult your owner’s manual. 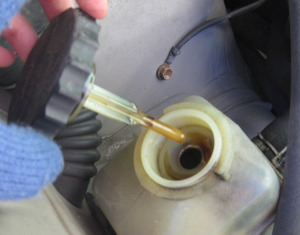 The fluid reservoir may be transparent and have “high” and “low” markers; if not, it will have a dipstick, similar to your oil reservoir’s, that will allow you to check the fluid level (see figure 2). Use the same procedure that you would for checking oil levels. [Link to entry on checking oil.] Your car may have markings for “hot” and “cold” levels, depending on whether the car has been running recently or not, similar to the automatic transmission fluid. If the fluid is low, add more fluid, using a funnel to prevent spilling. If fluid levels drop again soon after adding fluid, there’s a strong possibility of a leak, and you should have the system checked more thoroughly. If the fluid level is fine, try listening to your steering as you drive. If you notice an odd noise or feel stronger resistance when turning, then there’s likely a problem with the power steering pump or belt. A lack of lubrication in the steering system or an improper alignment of the front suspension could also be making steering difficult. Since most power steering systems are very easy to control, you may not notice the car “pulling” in one direction or another. You can diagnose this kind of problem by taking your hands off the steering wheel and seeing if the car continues in a straight line or drifts one way or the other. If the latter is the case, there’s likely a problem with the alignment of your wheels. Drifting could also be caused by worn tires or tires that are inflated unevenly. Check your tire pressure and tread depth. If your tires are fine, this could be a symptom of a dragging brake on one of your wheels. If your steering wheel vibrates when you accelerate, then it’s likely that there’s a problem in the suspension or the tires. This could mean that the wheel bolts are loose or the tires are worn unevenly. You should test to make sure none of the wheels are loose by shaking each wheel while the car is parked. This should cause some movement in the car (unless it is very heavy.) However, the wheel shouldn’t move independently from the car. If it does, you should first try to tighten the lug nuts, as you would when replacing a flat tire. If the lug nuts appear damaged or won’t tighten, then it’s time to replace them. Should tightening the lug nuts not correct the problem, then there’s probably damage to the wheel bearing or tie rod. However, if the whole car shakes at high speeds, you probably have a tire or axle that’s not rotating probably, as this kind of problem tends to be amplified at particular speeds. This is probably the result of damage to the suspension. Damaged strut bearings, a broken strut, or worn shock absorbers could be the culprits. Increased swaying or bouncing on uneven roads may also be a symptom of this kind of suspension problem. You can check for a bad strut by pushing down on each corner of the car. If it takes several bounces for the car to settle, then there’s likely a problem somewhere in the strut assembly; this could be caused by a broken coil spring (which will probably produce a rattling sound), oil leaking from the shock absorber, or another structural problem. This is probably being caused by the power steering belt, which connects the power steering pump to the engine. The belt could be worn or too loose. While this may be an easy part to replace in older cars, many newer models use a “serpentine belt” to connect all accessories to the engine; this will be more difficult to replace. 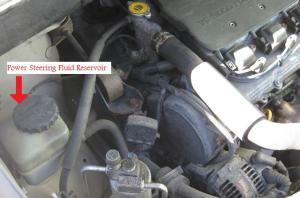 A screeching sound could also be the result of low fluid levels, so make sure to also check your power steering fluid. As always, an ounce of prevention is worth a pound of cure. Check the condition of your power steering belt and fluid levels whenever you check your oil and tires. Additionally, make sure to drive carefully. Hitting potholes or grazing a curb can bend suspension components and put wheels out of alignment, which can result in further damage to tires, steering, and suspension.